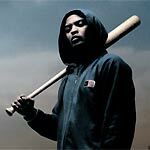 Gritty urban drama Kidulthood, which was written by Doctor Who star Noel Clarke, will be released on DVD on May the 22nd by Revolver Entertainment. The disc will feature what looks like a good array of bonus material: interviews with director Menhaj Huda, music supervisor Ian Neil, actors Noel Clarke, Jaime Winstone, Aml Ameem and Red Madrell; premiere footage; after-party footage (including performances by Skinny Man and Singa Blinga, Blak Twang, Roots Manuva, DJ Skitz, MCD and Million Dan); exclusive Arkane music video (Supo Mungam); trailer; uncensored deleted scenes and exclusive behind-the-scenes footage. Total running time is given as "187 mins approx", so the bonus material should add up to about ninety minutes. Technical spec's weren't announced. RRP for the disc is £15.99. Thanks to Evan Marshall for providing these! Click on the images to get the latest updates from the Incoming database on these! I've received a copy of Fox's Shock Treatment DVD, which is due for release on May the 22nd. The film will be available in two versions: a simple box set, which pairs the film with a re-released version of The Rocky Horror Picture Show (here), or as a more lavish 'Lips' box set (here), which also contains a Shock Treatment soundtrack CD, a copy of the RHPS Audience Par-tic-i-pation Guide book, three Mick Rock stills, and two RHPS comic books. The Shock Treatment disc is a no-frills release, and this will no doubt dissapoint its loyal following. It features a trailer, which is relatively elaborate, but, aside from that, zilch. The film is presented in 1.85:1 anamorphic widescreen format, with Dolby Digital 2.0 audio (at 192kbps). The average bit-rate is 6Mb/s, because, unsurprisingly, it's on a DVD-5. The transfer is rather unimpressive, but it has vibrant colours, and - grain aside - is pretty clean. It is, of course, a huge improvement on what's available at the moment, which is nothing. Comparing the new disc to an off-air Sky Movies recording shows that the new transfer crops the full-frame image top and bottom, but this results in compositions which are far more appealing. Menu screens and a couple of sample grabs from early in the film can be seen here. If you've been on any of the cult TV-related message boards and forums in the last couple of weeks, the chances are that you'll have heard about the appeal to help Su Woodley, a mother of two who has been diagnosed with cancer. You can find a website organised by her Doctor Who-fan husband, Dave, here. 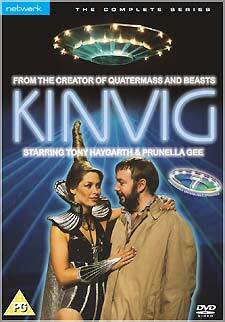 There's a thread about this on Roobarb's DVD Forum, which you can find here. 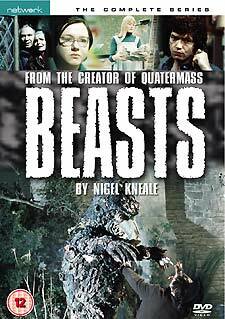 Their latest fund-raiser is an Ebay auction of props used in the Eye on Blatchford and Oh Mummy films, which were featured on the Doctor Who - City of Death and Doctor Who - Pyramids of Mars DVDs. These have been signed by Pyramids of Mars star Gabriel Woolf. You can find the items offered here. You can, of course, simply donate directly at Dave's website. Now, I know that over the last couple of years this website has probably saved you a few quid, especially if you've regularly visited our Incoming and Offers pages. Please make a donation to Dave and Su's appeal. Thank you. We have a treat for CSI fans today: interviews with two of the series' stars - Marg Helgenberger (who plays Catherine Willows) and Gary Dourdan (who plays Warrick Brown). The interview transcripts were kindly supplied by Momentum, and were in supplied in note form, so there are a few places where things perhaps don't make complete sense. I hope CSI fans won't mind that they're a bit rough-and-ready, and that they'll get a kick out of them. Click here for the interview with Marg Helgenberger, or here for the Gary Dourdan interview. Check out the best price for the new CSI set from our affiliates here. If you haven't visited our Incoming list in the last few days, do please check it out! Ceri's added dozens of tempting new titles, and there are more than a few great pre-order bargains to be found (on Alan Bleasdale's landmark Channel 4 series GBH, for example). 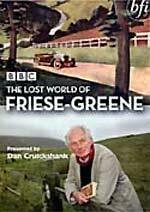 BFI Video will follow up their lauded release of The Lost World of Mitchell and Kenyon with The Lost World of Friese-Greene. The new disc features all three of the hour-long episodes of the series, which starts on BBC 2 this week. It features remarkable colour footage shot during a car journey from Land's End to John O'Groats, made in 1924 by pioneering filmmaker Claude Friese-Greene. The journey has been recreated by presenter Dan Cruikshank, who re-visits the places captured on film by Friese-Greene, and finds not only friends and relatives of those who appeared in the original film (called The Open Road), but also some of those who actually appeared in it as children! The DVD will feature a bonus featurette, More Stories, which includes an interview with renowned cinematographer Jack Cardiff, who remembers Friese-Greene, and extended interviews with contributors including the grandson of landscape artist Lamorna Birch, and the son of legendary Cardiff footballer Hughie Ferguson (total approx. 30m).The disc is released on May the 3rd (after the last episode is broadcast). The RRP is £19.99. Check out the disc's Incoming entry for the best offer from Zeta Minor's affiliates! Tartan's Asia Extreme label will continue to ride the J-Horror pony when it releases the first of six films created by the producer of the original Ring trilogy, Dark Water and The Grudge, Takashige "Taka" Ichise. The six films will be grouped under the J-Horror Theatre umbrella title. The first of these is Premonition which, as the title suggests, is about a man who can foresee the future. The disc will be released on June the 26th, with an RRP of £19.99. It will feature a Making of... documentary; footage from the Japanese Press Conference, and a featurette called Visual FX Exposed. Next up is Infection, which is due on July the 24th. It's about a viral outbreak at a hospital. Reincarnation will follow in August. The press release suggests that the discs will have anamorphic transfers, with a choice of Dolby Digital 2.0, 5.1 and DTS 5.1 audio tracks. Legendary Italian composer Ennio Morricone will perform a rare, one-off concert at the London Hammersmith Apollo Theatre on July the 19th, as part of this year's retrospective Don't Look Back concert series (official website). The concert will include material from the live Warner Records album Arena Concerto, recorded in Verona, Napoli, Rome and Siviglia, which includes material from the following films: Once Upon a Time in America, The Legend of 1900, The Mission, The Good, the Bad and the Ugly (titles), Once Upon a Time in the West, A Fistful of Dynamite, Cinema Paradiso, The Untouchables, Novecento, I Promessi Sposi, The Red Tent and Canone Inverso. He will be conducting the Gyor Philharmonic Orchestra and he Crouch End Festival Chorus Choir. Doors will open at 7pm, and there is no support act. Venue telephone: 0208 563 3800. Tickets, available from www.seetickets.com and other outlets, are £50, £40 and £35.